Clearaudio manufactures a complete line of turntables, tonearms, cartridges, phono stages, interconnect cables and more. Based in Germany, Clearaudio's ultrahigh precision construction techniques yield extremely high-quality, tight tolerance turntables for enjoyable vinyl playback and delivers a complete solution for your analogue needs. Certain elements will be found in all Clearaudio turntables. They include the inverted bearing made of bronze, brass and hardened steel. Motors are de-coupled and shielded to eliminate any negative impact of the motor on the turntable's chassis and thus the cartridge. Consequently, this guaranties that all Clearaudio turntables will run smoothly, without wow or flutter. The Emotion turntable. A great table at a very reasonable price. The Champion Series Simple design and great sound at a reasonable price. This is what the Champion series is all about. 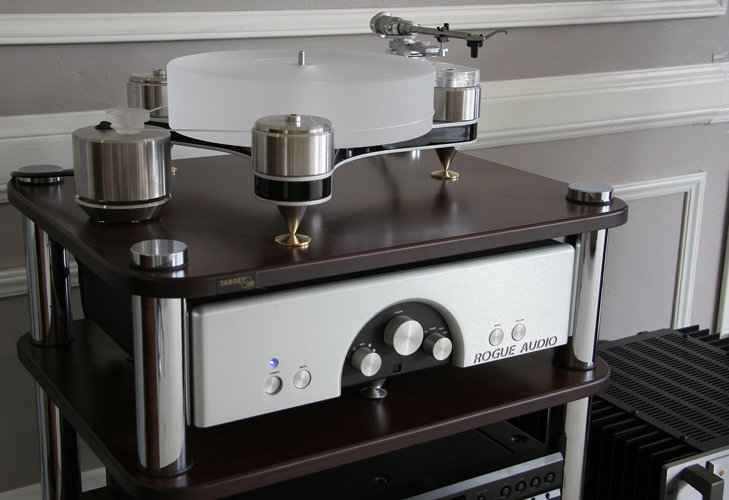 The Solution Series Solid bearing design with the capability to accommodate three tonearms on one table signify the Solution series. The Reference Series Pinnacle of performance and design. Linear Tracking Tonearms The latest incarnations of the venerable linear tracking tonearms. Pivoted Tonearms - New! Clearaudio offers a variety of pivoted tonearms from the new Unify unipivot tonearm from Clearaudio to the ever popular modified Rega tonearms. Moving Magnet Cartridges Clearaudio offers some of the most "open-sounding" moving magnet cartridges currently available. Moving Coil Cartridges The full range of Moving Coil cartridges that offer some of the best dynamics in the business. Micro Basic - New! A new level of performance for the budget oriented audiophile. Offers both MM and MC functionality. Basic Great entry level phono stage that offers both MM and MC capability. Balance Incredible MC performance with the option of using balanced outputs. Record Care - New! The Clearaudio Matrix record cleaning machine offers unsurpassed performance in a very attractive package. Equipment Stands - New! The Clearaudio Everest turntable stand specifically designed to enhance the high performance level of the Master Reference and Maximum Solution turntables. Isolation Devices - New! Clearaudio offers a full line of isolation products to help keep your system performing at its best. Other Accessories - New! Clearaudio offers a full line of accessories to complement your analog system. Interconnects - Under Construction Clearaudio offers an interconnect for every budget. Speaker Cables - Under Construction Clearaudio speaker cables feature MPC connectors and are terminated for both spade lugs and banana plugs.